More parents than ever now see mobiles as vital tools in supervising children's behaviour, giving them peace of mind, and making young people feel safer. Despite fears over "happy slapping", text bullying and mobile crime, parents say that young people are safer with them than without, say researchers. Young people were more concerned about happy slapping than their parents, with two-thirds reporting they had been a victim or knew someone who had been. The research was carried out by the The Trust for Study of Adolescence and showed that parents typically bought children mobiles when they moved to secondary schools so they could keep track of them and for emergencies. But while parents said they liked to call their children on the mobile because they felt more reassured when they actually heard their voice, young people preferred to text parents. The research also showed having a mobile increased young people's feeling of independence and was frequently used to plan arrangements both with parents and friends. Kerry Devitt, researcher for the Trust for the Study of Adolescence explained: "While mobile phones don't encourage young people to take more risks, they do see them as providing more flexibility." 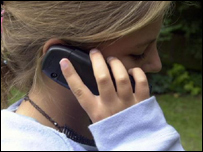 In particular, young people often used mobiles as a negotiating tool, often to stay out later. The fact that the child owned a mobile meant parents were more likely to be flexible in such arrangements, the researchers found. The study also showed that girls were much more likely to text parents to let them know they were safe than boys and were also more likely to use text messaging for social purposes. The Trust for the Study of Adolescence research included interviews with 60 families from across the UK from different social and ethnic backgrounds. Ofcom, the UK's communications regulator, recently reported that 82% of 12 to 15-year-olds owned a mobile phone while just under half (49%) of 8 to 11-year-olds had one. Across both age groups, they make an average of eight calls and send 25 text messages a week. It is not only parents who are seeking to connect with young people through mobile technologies. The prevalence of mobile phones among younger age groups has led politicians, civic organisations and campaign groups to look for ways to provide text messaging as a channel for interaction. In late 2004, the UK government offered the opportunity to "text Tony". People were invited to send a text question to the prime minister to be answered as part of a "mobile chat". Since then, there have been a number of initiatives to get young people more involved in politics through more mobile channels. The Hansard Society recently launched a Citizen Calling project (www.citizencalling.com) which asked young people to send messages or videos to the UK Parliament via their mobiles. These were then hosted on the campaign website and available for others to see. The impact of the pilot is currently being assessed. Other support groups, such as the Samaritans, have been running support services to enable young people to contact them using text messages. While the Samaritans' service is still in its pilot stage and is not yet rolled out across the country, since April the organisation has received nearly 80,000 texts from more than 3,000 callers - the equivalent of one text every three minutes. Part of the popularity of text messaging for young people come from the fact they see their mobiles as a key part of their identity. They are private, personal devices which give young people independence of both movement and communication. Text messages can be used in when it is difficult to talk, for example, or where teenagers do not want to be engaged in a conversation. While the Trust for the Study of Adolescence research provides some enlightenment for adults looking to understand how young people adapt new technologies, much is still unknown about the role of mobiles in their everyday lives. Little is known about how they impact the way young people from different socio-economic groups make friends, socially network and communicate with others in public and in private. But such an understanding is important if effective text-based support services are to be successful with young people and if the mobile is to be used as a way of getting more young people actively interested in politics.